A good homemade simple syrup enhances just about any cocktail recipe. Don't believe me? Why not whip up a batch for use in classic southern cocktails such as mint juleps, sazeracs and hurricanes. While there are infinite variations of the classic syrup which call for adding anything from lavender to fruit juice, for me the classic recipe listed below is the best. In a small saucepan, bring sugar and water to a boil; simmer until sugar has dissolved. Remove from stove and store in a classic mason jar. Will keep in the refrigerator indefinitely. * Tip- a good batch of simple syrup in a mason jar with a ribbon makes a delightful hostess or housewarming gift! This entry was posted on 6:45 PM and is filed under simple syrup , simple syrup recipe . You can follow any responses to this entry through the RSS 2.0 feed. You can leave a response, or trackback from your own site. 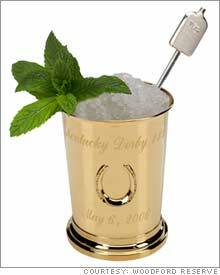 Looking forward to mint juleps next week! Wow, that simple? Thanks for sharing! Me too JMW! Tis the season, afterall.